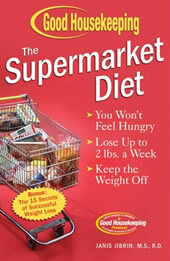 The Supermarket Diet is the creation of the diet and nutrition experts at Good Housekeeping. It was designed with convenience in mind and involves eating foods that are found in the supermarket. The basic philosophy of the diet is that you do not have to give up any favorite foods but instead learn to select healthier versions of these foods. No foods are strictly forbidden but dieters are advised to watch portion sizes. Dieters are also encouraged to prepare meals at home rather than eating out. This is a calorie controlled plan however it is not necessary for dieters to actually count calories. Dieters are provided with options for breakfast, lunch, dinner, and snacks. They simply need to select from these lists in order to create their own instant calorie controlled diet. The Supermarket Diet contains three different plans and dieters are recommended to select the plan most appropriate to their needs depending on their lifestyle and goals. Boot Camp is the most extreme of the plans with an average of 1200 calories per day. This plan is not suitable for men because their calorie requirements are generally much higher than women. Dieters are advised to follow this plan for no more than two weeks because any longer will result in a slowing of the metabolism. If excess hunger is experienced on this plan dieters should add an extra 100 calories per day. Keep On Losin’ is a 1500 calorie per day plan that may be followed until the goal weight is reached. Stay Slim Maintenance Plan is designed for dieters to follow once their goal weight is achieved or to maintain a healthy weight. It consists of 1800 calories per day. Many dieters will also be able to lose weight on this plan especially if they are very physically active. A wide range of foods are recommended including fresh fruit and vegetables, meat, eggs, low fat dairy, breads, cereals, legumes, nuts, and olive oil. Dieters are also permitted to eat frozen meals, 100 calorie packs of cakes and cookies, energy bars, low fat granola bars, pretzels, popcorn, baked tortilla chips, and frozen yogurt. Look here for more low Calorie meal ideas. 30-60 minutes of walking is recommended daily in The Supermarket Diet in addition to resistance exercises two-three times per week. Simple and very easy to follow. Very flexible and dieters do not have to give up their favorite foods. Encourages cooking meals at home with recipes that are quick and easy to prepare. Easy to follow when preparing meals for an entire family. Dieters are provided with detailed meal plans. Inexpensive and does not involve unusual ingredients or food combinations. The more extreme plans are low in calories and dieters may experience hunger and fatigue. Necessary to watch portion sizes. Dieters must refer to lists for suitable meals. Difficult to follow when eating out or traveling. Not ideal for those who don’t like to cook. Some dieters may rely excessively on prepackaged meals and snacks rather than fresh foods and this could limit the nutritional value of the diet. The Supermarket Diet will appeal to dieters who have a busy lifestyle and don’t want to spend too much time on meal planning or food preparation. It could actually be quite a healthy and balanced diet so long as dieters take care to include a high intake of fresh fruit and vegetables while limiting processed snack foods.